Private 315565 Arthur William Stevens, 1st Battalion, Devonshire Regiment. Arthur's Newbury home was 7 Craven Road; this became 46 Craven Road when the stretch between Kennet Road and Bartholomew Street, previously known as Craven Street was included. His home, and three others, have been demolished and replace by flats. The picture is of the section previously occupied by his home. Arthur was born in Shepton Beauchamp, Somerset, on 12 August 1882 and was christened in the local church two weeks later (27 August 1882). His parents were Arthur Stevens, a butler, and his wife Ann née Newis. Arthur was their second child; his elder sister, Mary, was born in 1879 – sadly she died in 1882, before Arthur was born. The next child, Thomas Michael, was also born in Shepton Beauchamp on 28 March 1884. 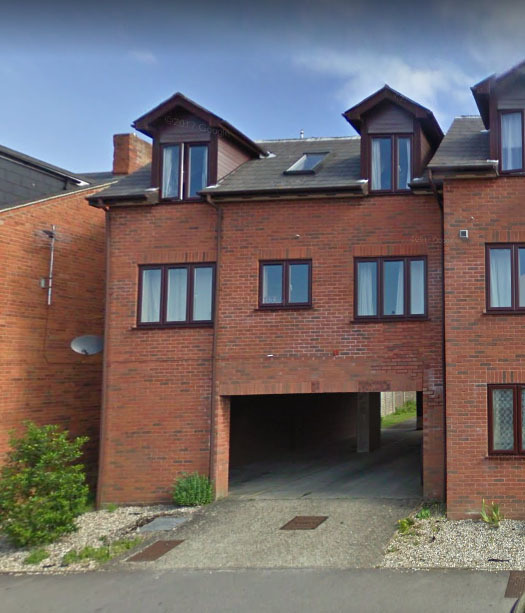 The following three children, Basil (4 July 1885), Agnes Lillian (4 March 1887) and Edith (14 August 1889) were born in Dorchester, Oxfordshire. The final surviving child, Theodore John, was born in Oxford on 2 March 1898. Through these moves Arthur senior changed career from butler to insurance agent. After his schooling was complete young Arthur found employment as a college servant at Keble College in Parks Road, Oxford. However, like his father, he too moved from domestic work to insurance and went to work for the Prudential Assurance Company. On 9 January 1909 he married Amelia Daisy Allmond at the parish church of St Mary and St John in Cowley, Oxford. Their first child, Kenneth Arthur was born on 12 November 1909. Arthur’s work took the family first to Eynsham in Oxfordshire (where Kenneth was born) and then, in 1912, to Newbury, where Arthur became Assistant Superintendent of the Prudential Assurance office working under George Slater, a future mayor of Newbury. The family settled at 7 Craven Road and another son, Ivor Paul, was born on 21 April 1913. When war broke out in 1914 many young men rushed to enlist in Kitchener’s new armies, but not many of these were married men with two young children and a good job - like Arthur. In order to fully utilise the country’s manpower in the war the government introduced conscription through the Military Service Act of January 1916. All men aged 18 to 41 were deemed to have enlisted and must await their call up papers. Some were exempt though the importance of the work they were doing to keep the country running and supply the armed forces with their ever increasing need for munitions and supplies. However, insurance agent was not deemed a vital role and Arthur received the call. 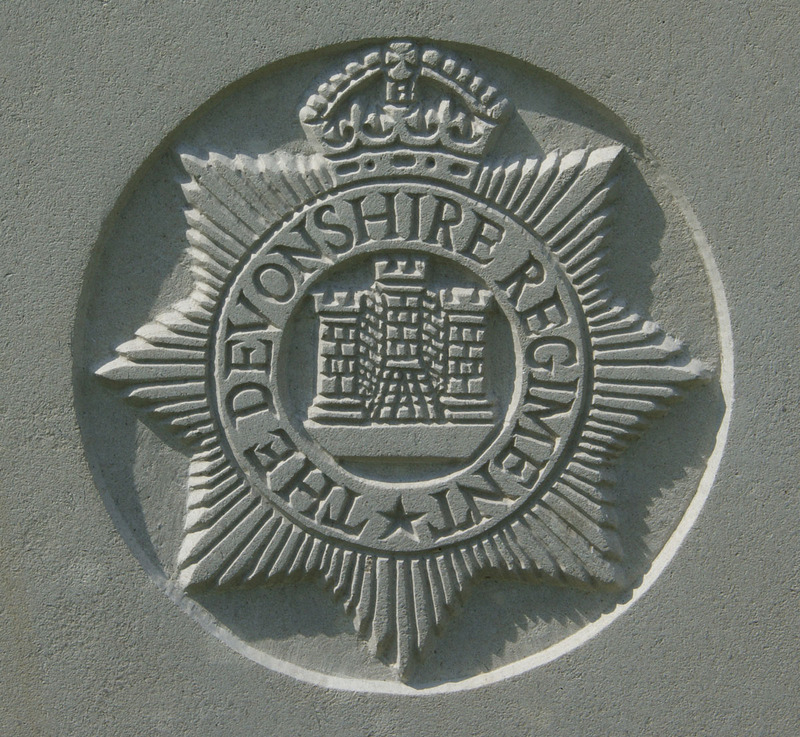 The regimental badge of the Devonshire Regiment, as used on CWGC headstones. After training in England Arthur was sent out to an Infantry Base Depot (IBD) in France in mid-1917 where he would spend some time (days or weeks) before being allocated to a battalion at the front. In his case he was sent to the 1st Battalion of the Devonshire Regiment. After a few months in France he was hospitalised for some unknown reason (sickness or wounds). A spell in hospital, providing the underlying reason was not serious, would usually be seen as a safe option, a chance to be away from the danger of the trenches for a while. Not in Arthur’s case – he was sent to one of the many hospitals in St Omer (probably No 58 General Hospital); while he was there the hospital was the target of a German air raid on the night of 30 September / 1 October 1917. Four nurses and a number of patients were killed and many more wounded.
. . . While here I received a telephone message saying that there had been a severe bombing raid at St. Omer, when 58 General Hospital has suffered considerably, one Staff Nurse and 2 V.A.D.’s having been killed as well as 16 patients. One Staff Nurse had been seriously wounded and 2 slightly wounded as well as 67 seriously wounded patients. In consequence, I telephoned to the D.M.S. 3rd Army letting him know that it would not be possible for me to continue my work in the Army for the present. Arthur was among those wounded. He succumbed to these new wounds on 4 October. A general/stationary hospital ward in normal operation (left) and the effect of the St Omer bombing, probably on 58 General Hospital (right). Mrs Stevens, of Craven-road, was on Saturday morning notified of the distressing news of the death of her husband, Private Arthur William Stevens, of the 1st Devons. He had only been out three months, and was admitted into hospital, whether from sickness or wounds the information is not to hand, but death resulted from wounds caused through a bombing attack of the hospital in which he was a patient. The chaplain, in a sympathetic letter, said, “I was able to be with him very shortly before his death. Please accept my deepest sympathy in your bereavement. I know that even in your grief you will be proud to think your husband has made the great sacrifice, and met his death so bravely and so peacefully. The funeral took place in the nicely kept military cemetery here. May God, who gave His Son to die for us, help you to bear the loss and give you the comfort of His presence.” The hospital staff also conveyed their sympathy, and said the deceased always greeted them with “a plucky smile.” Pte Stevens was a native of Shepton Beauchamp, and was educated at Oxford. He was 36 years of age, and five years ago came to Newbury from Eynsham, to act as the Assistant Superintendent of the Prudential Assurance Company, the directors of which have desired Mr G E Slater, the local Superintendent, to convey to the widow their deep sympathy and their high sense of his capability and strict integrity. His widow, one the brightest and bravest of women, has two children, boys of seven and four, and sincere sympathy is felt for them in their great loss. In the context of a war where almost a million British and Empire personnel lost their lives the bombing of the hospitals in St Omer was a minor event. Only nine were killed on the night, a few more, like Arthur, would subsequently die from injuries sustained in the raid - yet, coincidently, a second Newburian lost his life at No 4 Stationary Hospital in the same raid – Sergeant Major Francis Henry Jones of the Royal Army Medical Corps. Arthur was buried in grave IV.E.24 at Longuenesse (St. Omer) Souvenir Cemetery. Locally he his remembered on tablet 1 of the Newbury Town War Memorial and on the roll of honour and memorial board in St Nicolas’ Church. Arthur’s widow, Amelia, raised their children (Ivor died in 1928 aged only 15) and did not remarry until late in life, when, aged 57, she married Arthur’s brother, Thomas Michael Stevens, on 14 May 1942 in Oxford. Thomas Michael Stevens spent the war in the Royal Army Medical Corps (RAMC) having served as a pre-war Territorial at the Royal Victoria Hospital at Netley near Southampton. He probably spent most of the war at Netley but was sent to France on 1 August 1918. He rose to the rank of Quartermaster & Captain an honorary commission that provided the necessary rank and position to exercise the duties of a quartermaster to a large concern such as the enormous Netley hospital. It appears that he took a drop in rank to Quartermaster & Lieutenant in order to go to France. Basil and Theodore John Stevens also seem to have served in the RAMC. Basil as a sergeant and Theodore as a private, however, with the information available it is not possible to be sure that the two RAMC men of these names were Arthur’s brothers. 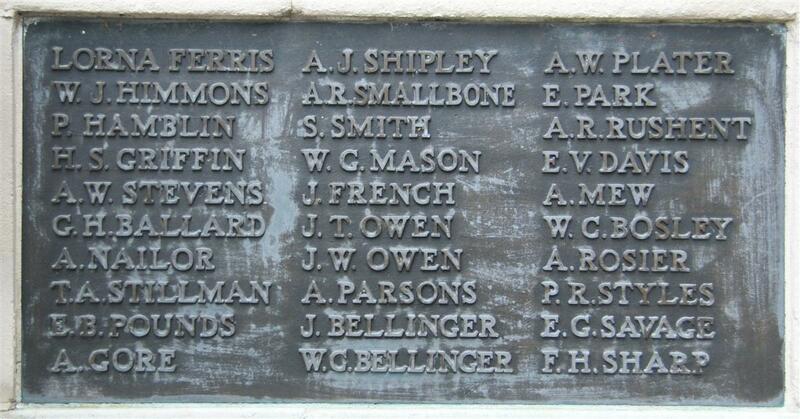 However, they are rare forenames; both the men served in France and survived the war.